People who are trying to lose weight often choose to eat at Subway because they think that the food is healthier. Many Subway menu items are nutritious and lower in both fat and calories. But not all menu choices are good for your diet. To keep your healthy eating plan on track, its important to check Subway calories and carb counts before you order. Smart dieters (and healthy eaters) will check the online nutritional information before they order a Subway sandwich. It's a great way to make a good choice and order a lower-calorie sandwich. But only if you order exactly the sandwich that is listed on the nutrition fact sheet. Many dieters don't and that's a huge mistake. The nutritional information provided at Subway usually includes values for sandwiches made with 9-grain wheat bread, lettuce, tomatoes, onions, green peppers, and cucumbers. There is no added cheese, mayonnaise, avocado or extra meat. In addition, all calorie counts are for 6" sandwiches. If you buy a footlong Subway, you need to double the values. So how do you calculate the calorie count of the Subway sandwich prepared the way you like it? The Subway website has a tool that allows you to customize your sandwich and then provides nutritional information for that sandwich. Just be sure to click the "Customize Yours" button below the nutritional data provided for each sandwich. For people who are trying to lose weight, the Veggie Delight sandwich is a popular choice. 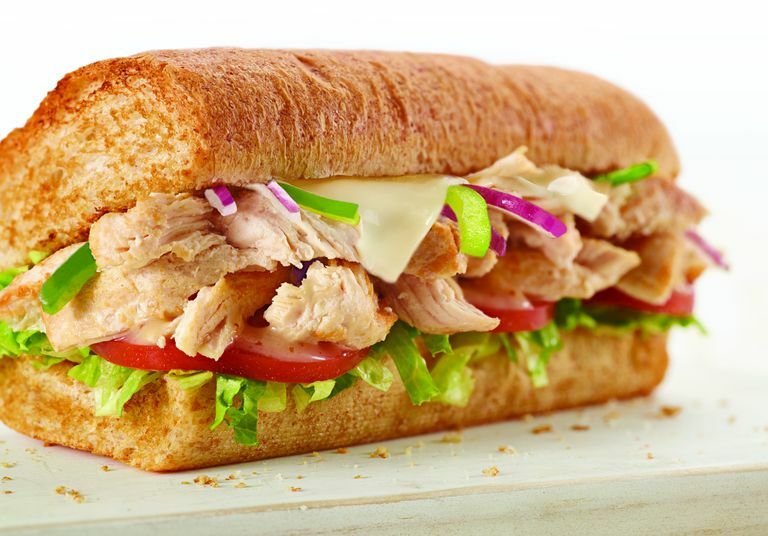 At just 230 calories for a 6-inch sub, it's a smart low cal option. This sub provides five grams of hunger-busting fiber and eight grams of protein. It also provides 44 grams of carbohydrate or 39 net carbs. If you're trying to boost your protein intake, or if you tend to get hungry again shortly after eating, you may want to choose a Subway sandwich with more protein. There are several healthy choices with lean meats that provide enough protein to keep you feeling full and satisfied. Each of these 6-inch sandwich is made with no mayo, no cheese and full of fresh veggies. Calorie counts for salads are without dressing. If you add Subway Vinaigrette add another 100 calories and 10 grams of fat. Or simply dress your salad with vinegar to avoid the extra calories. If you follow a low carbohydrate diet for health or weight loss, you'll have plenty of choices at Subway. But a subway sandwich will not be one of them. The bread used to make Subway is high in carbohydrate. The highest carb bread is 9-Grain Honey Oat Bread with 43 grams of carbohydrate. The lowest carb bread is Rye Bread with 34 grams of carbohydrate and 4 grams of fiber (30 grams of net carb). Remember that you can customize any salad or sandwich at Subway. When you order your salad, skip the starchy toppings and fill your bowl with the lowest carbohydrate vegetables like hearty greens, mushrooms, and avocado. And of course, avoid sugary drinks and sides (like cookies). Think every sandwich at Subway is healthy? Think again! Just like every other fast food restaurant, there are healthy choices and not-so-healthy choices on the menu. These are the items to avoid if you want to keep your calorie count in check when you eat at Subway. Use these tips to eat fewer calories the next time you go to Subway. Take advantage of toppings. Add flavor to your sandwich with low-calorie toppings. Add banana peppers, extra cucumbers, green peppers, jalapeno, pickles, olives or spinach for five extra calories or less. Skip the mayonnaise (110 calories), ranch dressing (110 calories), Chipotle Southwest Sauce (100 calories), and even guacamole (70 calories) to decrease fat and calories. Choose low-calorie bread. Don't be fooled by bread names that sound healthy. The lowest calorie bread at Subway is actually the sourdough bread, with 190 calories. Honey Oat 9-Grain Wheat has 230 calories. That's a difference of 80 calories if you order a footlong Subway sandwich. Order in advance online. One of the easiest ways to make sure that you are not distracted by high-calorie sandwich choices at the restaurant is to order your meal online. At participating Subway locations, you can pre-order a diet-friendly lunch and your order is ready for pick-up in 15 minutes after confirmation. Use the Fresh Fit menu. If you don't have time to customize a sandwich online, visit the Fresh Fit menu and choose one the menu items listed. Many of them provide around 300 calories along with protein and fiber to help you feel fuller longer throughout the day. And if you order the sandwich as recommended you'll get 2 of your daily servings of veggies. Consider Subway for breakfast. Most people think of Subway for lunch or dinner. But you can also visit the quick-serve restaurant for your morning meal. The breakfast sandwiches can be customized to keep calories in check. An Egg White and Cheese Sandwich, for example, provides 330 calories, 8 grams of fat, 4 grams of fiber and 20 grams of protein. And lastly, skip the chips and cookie if you can. A chocolate chip cookie will add 200 calories to your meal and Lays Potato Chips will add another 230 calories. Drink water and eat a piece of fruit from home to keep your Subway meal low in calories and healthy, too.